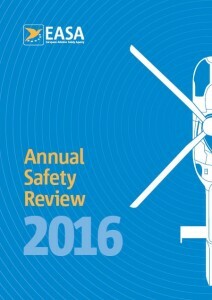 The European Aviation Safety Agency (EASA) Annual Safety Review for 2016 is now available. The Review has been published since 2005 and the content of the document continues to evolve. 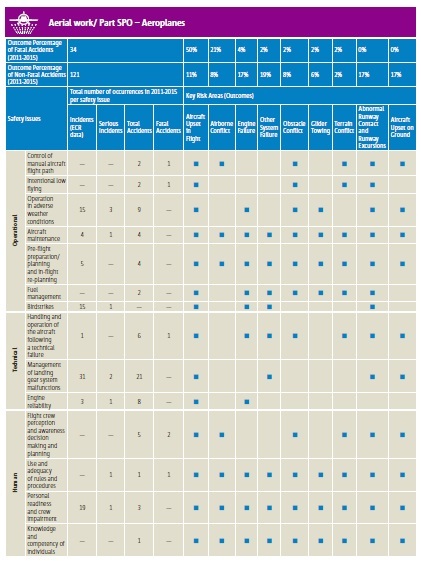 Safety Risk Portfolios are now provided for 10 different operational domains. For the first time analysis is provided on Remotely Piloted Aircraft System (RPAS) operations, otherwise known as drones. 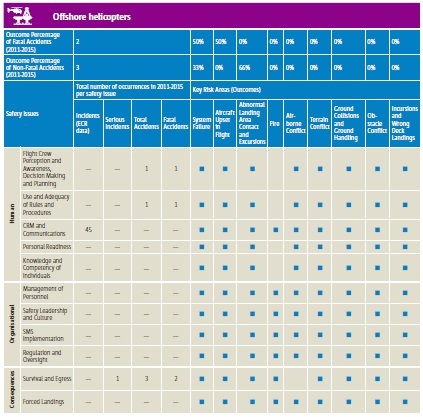 The Safety Risk Portfolios directly support the European Plan for Aviation Safety (EPAS). Note there was no Annual Safety Review for 2015 as from this year the year in the title is that of publication not the last full year of data. CAT [Commercial Air Transport] Aeroplanes: In 2015 the domain with the highest number of fatalities was CAT Aeroplanes. This involved a single fatal accident, which was the [A320 D-AIPX] Germanwings accident that occurred on 24 March 2015. In 2014, there were 2 fatal accidents and there has not been more than 2 fatal accidents in CAT Aeroplanes since 2005. This operational domain is the greatest focus of EASA’s safety activities and the reorganisation of the collaborative groups and advisory bodies will help the Agency to learn more about the safety challenges faced by airlines and manufacturers. Non-Commercial Aeroplanes: In terms of fatal accidents, the second highest number occurred in non-commercial operations with aeroplanes. This domain also had the second highest number of fatalities with 65, which is less than the 10-year annual average of 79. The General Aviation Roadmap is key to the Agency’s strategy for non-commercial aeroplanes and the establishment of a Collaborative Analysis Group (CAG) in this area to support the work of the current General Aviation Sub-Safety Consultative Committee will help to identify the most effective safety actions. Gliders/Sailplanes: The domain of glider/sailplane operations had the 3rd highest number of fatalities with 27 and the 2nd highest number of fatal accidents, of which there were 24. Both the number of fatalities and the number of fatal accidents were slightly higher than the 10-year annual average. 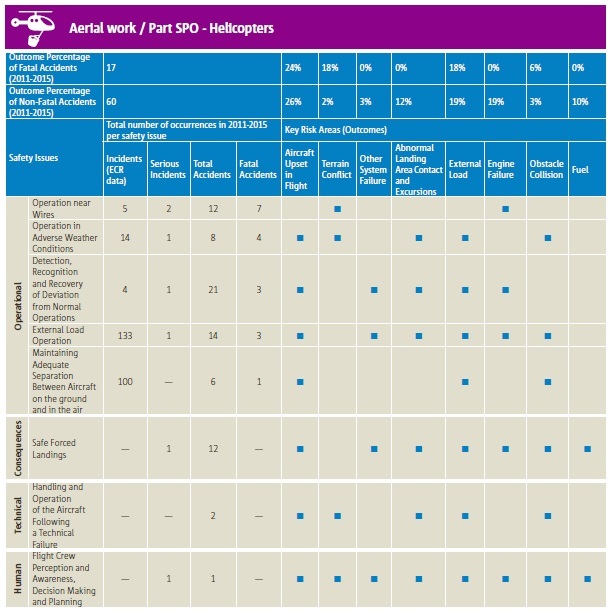 Aerial Work/Part SPO [Specialised Operations] Aeroplanes: In 2015, there were 2 major accidents involving aerial work/Part SPO operations with aeroplanes. They were an airborne collision between 2 LET-410 aircraft [OM-SAB and OM-ODQ] taking part in parachuting operations in Slovakia, which led to 7 fatalities, and the [Hawker Hunter T7 G-BXFI] Shoreham Airshow accident in the United Kingdom where there were 11 ground fatalities [see UK AAIB Special Bulletins S3/2015, S4/2015 and S1/2016]. These 2 accidents led to a much higher number of fatalities compared with the 10-year annual average despite there being the same number of fatal accidents. Following the Shoreham accident, the UK CAA completed a review of public air display arrangements and produced an associated actions report. In addition, EASA is currently performing specific analysis on parachuting operations to understand more about the risks and consider how improvements can be made with experts from this domain. 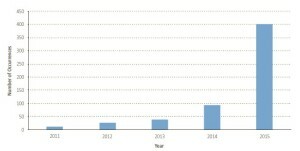 Non-Commercial Helicopters: non-commercial helicopter operations had the 5th highest number of fatalities, which was a reduction of more than 50% when compared with the 10-year annual average. The one fatal EASA MS CAT Aeroplane accident, as mentioned above, was the Germanwings accident. …there was a higher number of non-fatal accidents involving EASA MS operators in 2015 than the 10-year average, with 24 compared to the average of 21.8 over the previous 10 years. At the same time, there was a 24% reduction in the number of serious incidents over the same period with a total of 58 serious incidents compared with the average of 75.8. In terms of fatalities, the single fatal accident resulted in 150 fatalities, which is higher than the 10 year average. There was also a slight increase in serious injuries with 11 compared with 9.2 over the previous 10 years. There were no offshore fatal accidents during 2015 (compared to a 10 year average of 1.3), 1 non-fatal accident (compared to a 10 year average of 2.2) and no serious incidents (compared to a 10 year average of 1.8) . The past 2 years has seen no fatal accidents in offshore helicopters and there has been a continual improvement since 2006 when there were 3 fatal accidents and 5 non-fatal accidents. There have been no fatalities or serious injuries in offshore helicopters over the past 2 years [2014 and 2015]. 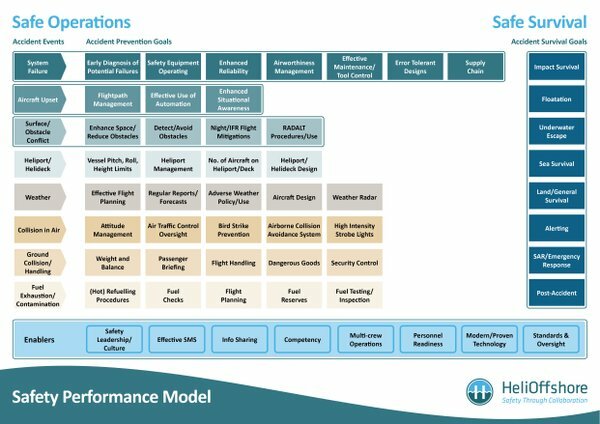 This Safety Risk Portfolio has influenced the prioritisation of within the HeliOffshore Safety Performance Model, launched at their 2016 conference and inspired by the Flight Safety Foundation (FSF) Basic Aviation Risk Standard for Offshore Helicopter Operations (BARS OHO) bow-tie presented at the 2015 HeliOffshore conference (which we discussed last year). UPDATE 1 February 2017: BARSOHO Version 3, fully aligned with the HeliOffshore SPM, is issued and available. The loss of an EC225 in Norway in 2016 with 13 fatalities falls outside the scope of the 2016 report but reinforce the importance of focusing system failures and technical resilience and reliability. There were 1 fatal and 8 non-fatal accidents in this domain during 2015 [vs 10 year averages of 2 and 6.9] and only 1 serious incident [vs 2.4]. The fatal accident, a HEMS flight in Slovakia [A109K2 OM-ATB], involved 4 fatalities [compared to a 10 year average of 9.1 fatalities]. In addition, a total of 7 serious injuries have been reported in non-offshore CAT helicopter operations in 2015 [vs an average of 4.1]. The numbers of non-fatal accidents and serious injuries were above the averages of the preceding 10-year period. There were the same number of fatal accidents in 2015  compared to the 10-year average and there were also a slightly lower number of non-fatal accidents [22 vs 23.5]. However, the numbers of fatalities  and serious injuries  in 2015 were significantly higher than the averages for the preceding decade [11.3 and 5.6]. There was an airborne collision between 2 LET-410 aircraft involved in Parachuting operations in Slovakia, which led to 7 fatalities and the Shoreham Air Show accident in the United Kingdom led to 11 ground fatalities. 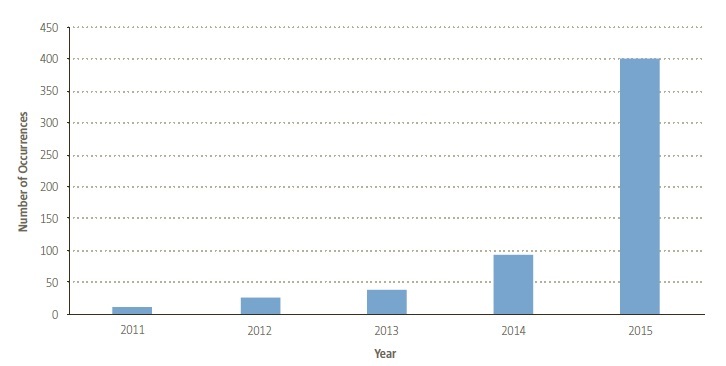 There were 2 fatal accidents in Part SPO helicopter operations in 2015 resulting in 4 fatalities, both of which are significantly below the preceding 10-year average [4.3 accidents and 8.5 fatalities]. There was also a lower number of non-fatal accidents [7 vs a 10 year average of 18]. This includes flight training as well as all non-commercial activities. The number of fatal accidents  were slightly below the 10-year average [42.2], whilst the number of non-fatal accident was significantly lower [279 vs 338]. In terms of fatalities , there were 13 fewer fatalities than the 10-year average  and also a lower number of serious injuries [36 vs 43.9]. There were 6 fatal accidents in 2015, compared with the 10-year average of 8.2. There were also a lower number of non-fatal accidents  than the 10-year average [47.1]. The number of fatalities in 2015  was half the 10-year average [14.5], while there was also a lower number of serious injuries [5 vs 8.6]. In 2015 there were 2 fatal accidents in balloons, leading to 3 fatalities, both of which were higher than the 5-year average. There was also an increase in the number of non-fatal accidents and serious injuries. For gliders, there was a slightly higher number of fatal accidents and fatalities in 2015 with 24 fatal accidents and 27 fatalities. The number of non-fatal accidents was slightly lower than the 10-year average with 156. There was a slight increase in the number of serious injuries with 36. 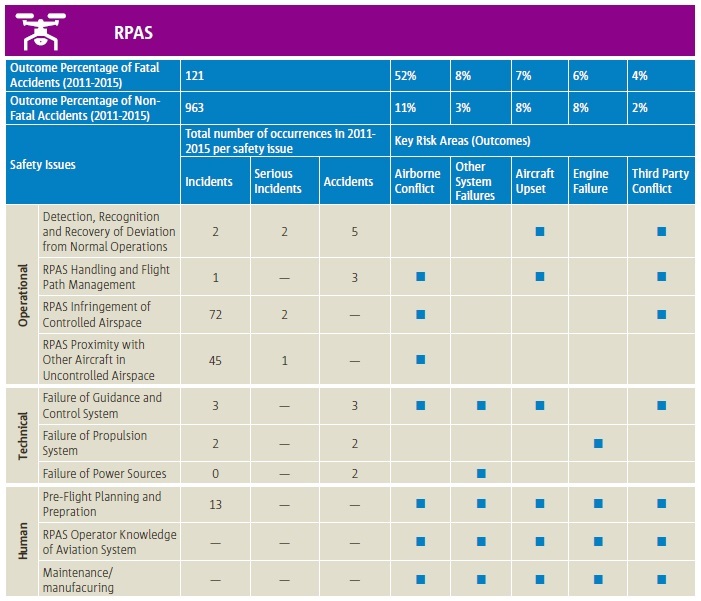 Analysis of RPAS occurrences in the European Central Repository identified 584 occurrences of all severity levels, of which 37 accidents had been classed as accidents, none of the accidents involved fatalities and there were only four minor injuries reported in the period since 2010. The collection of data on RPAS occurrences is still in its infancy and there is still work to be done to ensure the correct application of taxonomy terminology related to RPAS. The application of the definition of accident in relation to RPAS has improved since new definitions were provided in ICAO Annex 13. However the data in ECR covers a period before this and therefore the definition of accident may not have been correctly captured in some of the older data. Review all relevant occurrences including the occurrences collected by the European Member States. 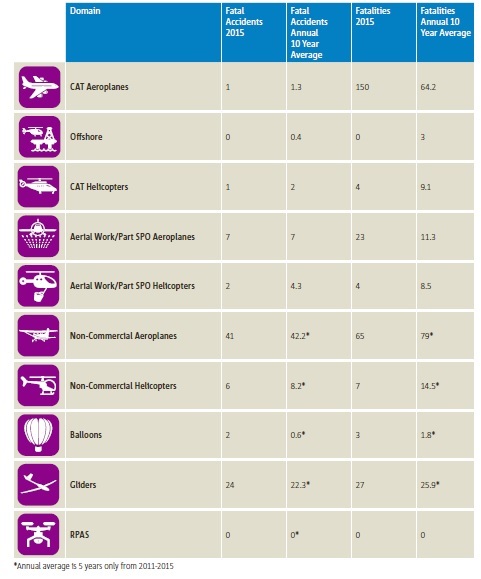 Analyse the existing studies on the subject of impact between drones and aircraft. 1) Study the vulnerabilities of aircraft (windshields, engines, and airframe) taking into account the different categories of aircraft (large aeroplanes, general aviation, and helicopters) and their associated design and operational requirements. 2) Consider the possibility to do further research and perform actual tests (for example on windshields). In 2015 there were no fatal accidents in EASA MS aerodrome operations and 15 non-fatal accidents, which is significantly lower than the average of the preceding 10-year period. 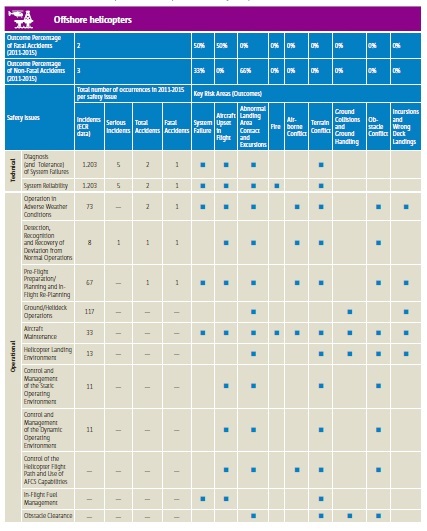 A full safety risk portfolio for aerodromes is currently under development and more detailed analysis and discussion on specific safety issues for both aerodrome and ground handling will take place in the CAG. 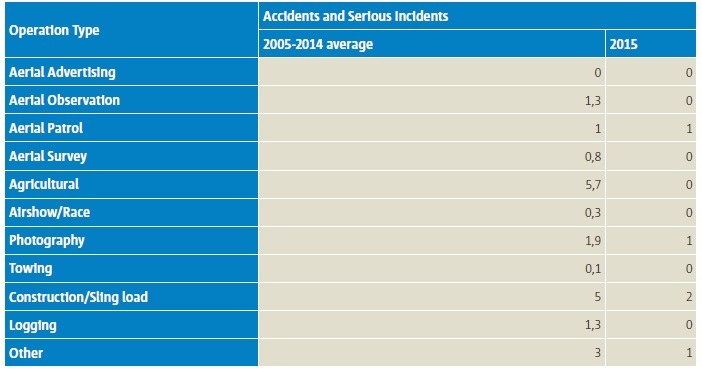 There were no accidents related to ATM/ANS operations provided in an EASA MS in 2015, following the trend of 2014, and while the total number of non-fatal accidents  was similar to the preceding ten-year average [5.7], the number of serious incidents decreased over the average of that ten-year period [20 vs 36.4]. The number of serious injuries  is slightly higher than the average of the ten-year period [3.6]. They may be outside of organisational control. Conflict Zones: Since the tragic event of the downing of Malaysian Airlines flight MH17 there is a general consensus that States shall share their information about possible risks in conflict zones. Numerous initiatives have been taken to inform the airlines about the risks on their international flights. At global level, in April 2015 ICAO launched a central repository where each State can notify on a voluntary basis its information about a particular risks in conflict zones. All information provided by EASA on conflict zones is available on the EASA Website, including Safety Information Bulletins and the task force report. Cyber Security: A number of high profile activities are underway in the area of cyber security and a cyber-security roadmap has been developed by EASA in coordination with the European Commission. The roadmap proposes an approach to aviation cyber-security in Europe by identifying strategic objectives, enablers in the domains of regulation and standards, research and cybersecurity promotion initiatives. In particular, the Aviation Computer Emergency Response Team (AV-CERT) is currently in the process of being established by the Agency. 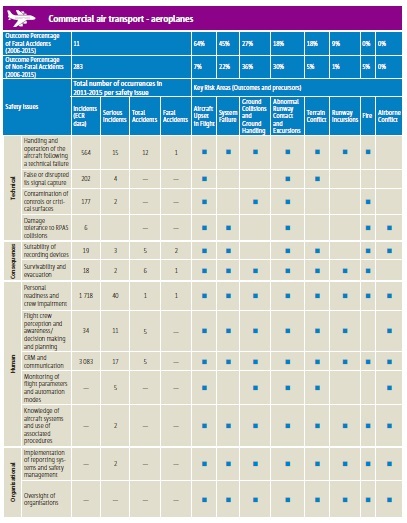 We examined the 2013 EASA Annual Safety Report here. We examined the 2014 EASA Annual Safety Report here. 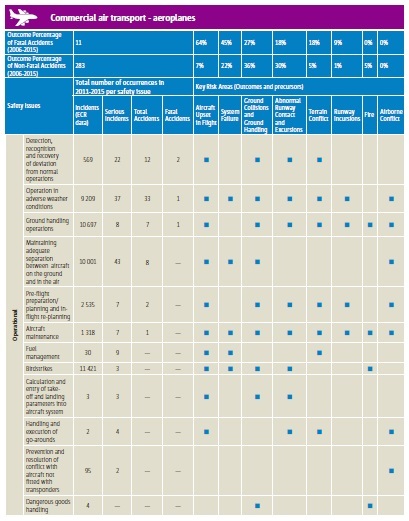 Aerossurance also first discussed Performance Based Regulation in 2014 and again in 2015. UPDATE 10 May 2017: EASA have published their safety recommendation response progress (catalogued in their Annual Safety Recommendations Review 2016).